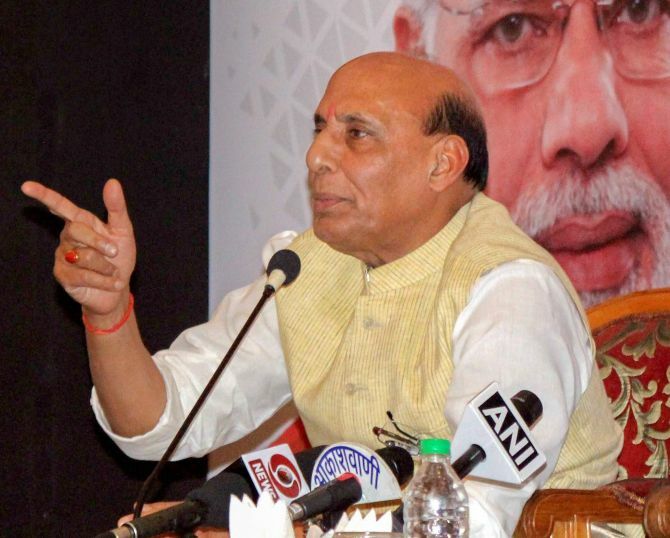 With the Bharatiya Janata Party facing reverses in bypolls to Lok Sabha and assembly constituencies, Union Home Minister Rajnath Singh on Thursday said one has to take two steps backward before a big leap. Asked about the BJP's performance in the by-elections to 11 assembly and four Lok Sabha seats in various states ahead of next year's general polls, Singh, in a lighter vein, said, "For a massive leap, one always has to go two steps backward." "We are going to take a massive leap," the senior BJP leader said. The former chief minister of Uttar Pradesh was addressing a press conference in Bhopal to highlight the National Democratic Alliance government's achievements in the last four years. Dealing a body blow to the ruling BJP, opposition parties emerged victorious in 11 out of 14 bypolls while limiting the saffron party and its allies at just three and snatching the high-profile Kairana Lok Sabha seat in Uttar Pradesh with a united force.